There was confusion about the identity of some of the players at the first day of Leeds United’s pre-season training last week, but none greater than that caused by the apparent reappearance of Tomas Brolin. What was that fat sod doing back at Leeds? What was with the short back and sides haircut? And why did he keep going in goal? This was no Tomas Brolin. This was Paddy Kenny. Kenny has apparently not boarded this morning’s flight to the training camp in Italy, with coverage of his post-summer size spreading from Twitter to Vine to the Daily Mail and beyond, alerting airline staff to the dangers of overloading the plane. Massimo Cellino has spoken recently of the difficulties of “pushing this plane full of people and luggage. And I’m dying,” and is not likely to have been pleased by the extra baggage Kenny has brought with him for the new season. But is Paddy Kenny really as far out of condition as is being claimed? 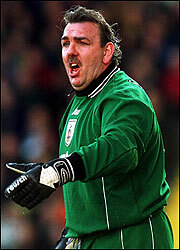 Goalkeepers from Fatty Foulke to Neville Southall to, well, Paddy Kenny have always been known to carry a bit of extra timber, but that doesn’t mean they aren’t fit to play top level football. Or medium level, given this is Leeds. And the YEP’s Leon Wobschall tweeted this morning that he’s “…told the footage of him doing the rounds is rubbish btw,” which is intriguing, as surely the camera doesn’t lie? Well, it does if the aspect ratio is all squashed to make all the players look about five feet four and wearing clown pants; it also does if unscrupulous Photoshopping is brought to bear upon the pixels. But what is the truth? In an effort to establish once and for all how hard Paddy Kenny has been hitting the salad bar over summer, here is all the footage of pre-season Patrick that I could find – with all aspect ratios preserved from the originals – presented in Zapruder-style forensic slo-mo for you to make your own minds up. And here’s a clip of the competition: the BBC’s Adam Pope is adamant that Leeds will be signing Marco Silvestri, a 23 year old goalkeeper who played three games for Cagliari last season on loan from Chievo, who certainly seems, well, nimble. Some would say showboaty. Of course, it’s not so simple to replace Paddy Kenny. So far in his career Paddy has played for Bury (signed by Neil Warnock), Sheffield United (signed by Neil Warnock), QPR (signed by Neil Warnock) and Leeds (signed by you get the gist). With Colin currently without a club, Kenny might have to wait for Warnock to get a new job before he can move on from Leeds. But with the Thorp Arch canteen closed and the rest of the squad living the smooth life in Sardinia for a fortnight, I suspect Kenny might just move on to wherever he can forage for food.